Alright, this is being left open to former members to see. This is how our restart is going to work. 1. All prior canon we played through is being wiped! We are going to go for a proper restart, so that we're as accessible to newcomers as possible. HOWEVER if there are threads that you absolutely don't want to lose, then it's up to you to save and repost them, once the game is reopened. 3. We're going to go advertising heavy for three rounds of advertising, or maybe four. If by that time we don't draw enough players, we're going to open up the character limit, and the game will settle into a lightly advertised semi-private game, running along the lines of Pensieve, a small game that runs slowly, but stays open. We'll still be open to new players, but we won't go actively hunting for them as much, and plot-pushes and prompts will come less often, it will be more of a casual game without strict update limits. Unless those circumstances arise, we will have standard two-week thread and/or journal update limits. 4. NO ONE should feel obligated to keep the same kids from before, or to play if they don't want to. Most of us already play in two games together, so if you're just not up for a third, that's fine. We won't hold it against you. If you'd like to hold a character until after RL settles for you to play later, then go ahead and grab Tygs or Dena on AIM and we can talk about it. 5. If you have friends who are looking for a game, or would like to try something new, by all means bring them over. If you have plot ideas, storylines from the comics/cartoons/etc that you'd like to bring in - by all means, let us know. I think that covers it. We're still in the process of cleaning things up, so if you look over the info and see if there's something we haven't changed over yet, by all means let us know. IF you have questions/comments/condemnations, go ahead and comment here with it. Also go right ahead and give us journal names for your kid that you're starting with if you do plan to play, and we'll get you added. Feel free to pimp around on your own too, once we get the ad set up again. If there's anything we forgot, then let us know. 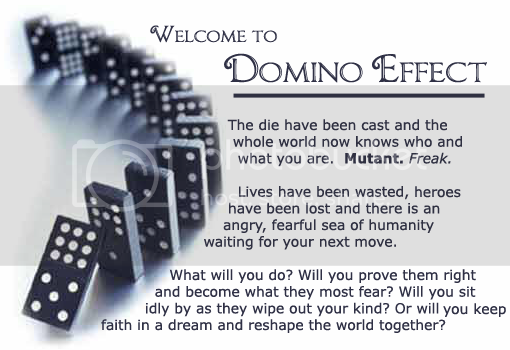 domino_effectis a ______________________ (See Rules and the Available pages for more info) and we are geared towards mature roleplayers with good writing skills, including themes sexual or violent in nature. Open for players 16+ older only please. [+] Accepting holds soon! Applications OPEN on __________!! [+] Friendly mods who run a strictly drama-free, fun playing enviroment. [+] Active plots, open to player feedback and suggestion. [+] Reflects most movie canon through all three films. [+] Strong focus on character development. [+] Het, Slash, Femmeslash friendly. [+] Rated G - NC-17.